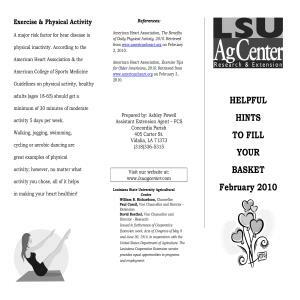 Please click on the image above for the PDF version of Helpful Hints to Fill Your Basket--February 2010. Pick activities that are fun and suit your needs. Wear comfortable, appropriate clothing and footwear. Find a companion to exercise with you. Take more time to warm up and cool down because muscular adaptation and elasticity generally slows with age. Make sure you stretch slowly. Start exercising at a low intensity and progress gradually. If you plan to be active more than 30 minutes, drink some water every 15 minutes. As you age, your sense of thirst tends to decrease and you can't completely rely on your internal sense of thirst. Place chicken breasts in a pot of hot water. Boil until done. Cut into bite sized pieces or shred. Add chicken to your favorite tomato sauce instead of ground beef. A major risk factor for hear disease is physical inactivity. According to theAmerican Heart Association & the American College of Sports Medicine Guidelines on physical activity, healthy adults (ages 18-65) should get a minimum of 30 minutes of moderate activity 5 days per week. Walking, jogging, swimming, cycling or aerobic dancing are great examples of physical activity; however, no matter what activity you chose, all of it helps in making your heart healthier!